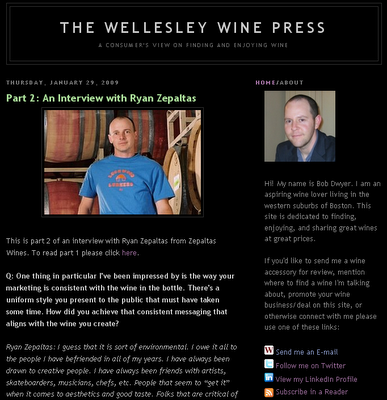 "I started The Wellesley Wine Press for a few reasons. First, I have a lot of information about wine running around in my head and increasingly it felt unbalanced to include all of that content on Casa Dwyer. Second, I wanted to try my hand at launching a website and making a tiny bit of money on small ads and product links. I don't have grand visions for making a fortune- my goal is to pay for the $8 domain registration within the first year." 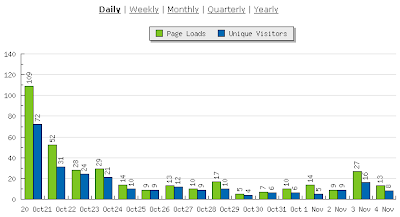 The dip in traffic in August was due to there being only 8 new posts which was coincident with our discovering Mad Men. Gary V is right when he says "Stop watching Lost" if you want to be successful online. It takes work, and work takes time, and the time has to come from somewhere. 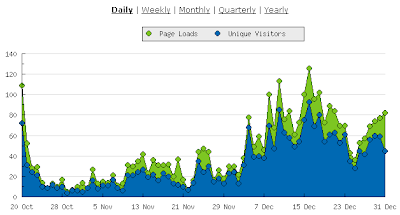 A typical day on the site is now around 200 page views. There are days when it spikes up, and days that are a little slower. What's interesting about watching traffic is that it's all relative to what you're used to. For some people, these numbers are so small they're a joke. For others, they're amazing. For me, it's still pretty amazing to think that there are enough people out there on the Internet who are interested in the subjects I'm writing about that they find their way to the site. My point: I think about every person who visits the site like they're a customer. I'm always thinking- is there anything I could do to be more useful to someone who's visiting the site? I'm still flattered when someone sends me an E-mail to ask my opinion of a product I've reviewed. Or a winery sends me an E-mail asking if I'd like a sample of their wines. Or a PR firm sends me an E-mail asking if I'll mention an event they're promoting. I appreciate all of these things. But the most precious thing to me, in terms of this site, is people who subscribe to my site via E-mail or in their feed reader. I think about them every time I publish a piece. Is what I'm writing good enough to warrant triggering an E-mail to these people who have shown enough interest in what I'm doing that they subscribed to updates? If you've subscribed to the site over the past year: THANK YOU. It really means a lot to me. 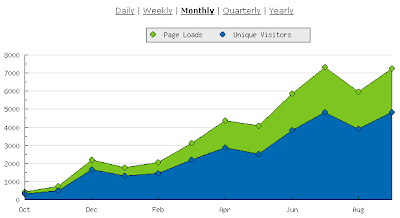 Looking back on my goal of recovering the $8 I spent to buy the domain "wellesleywinepress.com"... A lot of people I talked to when I launched the site were surprised to hear that I was interested in monetizing a blog. While making money is not my primary goal with this site, the exercise of learning how a blog works and how money can be made online has been fascinating to me. Blogging is far from passive income. In fact, it's probably the lowest hourly wage I've received for anything productive I've done in my life. More on that later, but for now I wanted to share an annual report on income and expenses for those of you who might be interested in starting your own blog (whether it be about wine or not). I've been very pleased with the Amazon Associate program. It's very easy to use, and it seems like everyone enjoys shopping through Amazon online. A quick aside on affiliate links... Around the time I started this site, I was in the market for a webcam. I didn't want to spend a lot of time researching the purchase, and as I started looking online I quickly found a website dedicated to webcam reviews: Cowboy Frank. I loved the hyper-focused no-nonsense easy-to-understand reviews he provided and it was a no-brainer to purchase a webcam through one of his Amazon Associate links. It was the least I could do! I hope my wine accessory reviews are similarly useful to people, and judging from the number of wine aerators that have been purchased through affiliate links on this site they have been. I'm genuinely pleased each time I see a purchase made through a link, and especially when people reach out with questions about wine accessories I've reviewed. I hope to continue this focus in the coming year. I've dabbled with a number of other affiliate programs but they've not generated meaningful revenue. Although I've looked into a number of them, I haven't found a good wine affiliate program. I attribute this to a combination of the fragmented wine shipping laws from state to state in this country -and- the lack of a well-run wine affiliate program. I'm hopeful that Amazon will sell wine some day because I like their affiliate program and would love to be able to link to wines sold through an Amazon Wine store. Maybe some day. In April of this year, I met Joe Roberts from 1WineDude at Wine Riot. I was talking with him about how hard it was to make money off ads on a wine blog. He pointed out that I might want to consider the retail value of wine I received as samples as a benefit of wine blogging. I hadn't received any samples at that point, but he suggested that samples would come if I kept blogging long enough. Indeed, he was right. Shortly after that conversation, I started receiving wine samples. To date, I'd estimate the retail value of wines received as samples at about $1,500. I don't make wine reviews the main focus of this site but I do enjoy trying wines I wouldn't normally try if not for samples. My thanks to the wineries that have sent samples to date. I hope that my occasional wine review has been fair and thoughtful. I'm always afraid of boring readers with mundane descriptions of wines received as samples. Looking forward to next year, I'd like to bring more focus to tasting reports, and a large part of that is going to be establishing a more regular review cycle which enables me to compare a number of wines from the same category. More on that in a future post. For now, if you happen to be in the wine trade and would like to send samples please have a look at my sample policy HERE. In addition to wine samples, I felt fortunate to be invited to a number of wine tasting events and dinners. Retail value of events attended was around $600. My favorite part of these events was gaining access to events normally reserved for those in the wine trade. Increasingly, as the year went on I felt like I was straddling the fence between "consumer" (which is indeed the unique perspective that I hope I bring to the wine conversation on this site) and "trade". More on that in a moment. Back to income- direct advertisers are where it's at. Earlier in the year, I came across THIS ARTICLE in the Wall Street Journal about traffic levels on blogs and income. I use information in this article to determine pricing levels for direct ads placed on this blog. The reason blogs like this one are smart money for advertising is because they have the potential to target such a precise audience. For example, where else can you find so many Massachusetts wine consumers interested in 90-point wines at bargain pricing? Where else can you find authentic, unbiased discussion about wine accessories? If you're interested in advertising on the site, please contact me. I'd love to chat with you about how advertising on the site can make sense for both of us. The reason I want to thank them, and this ties back to a couple of points I left hanging previously, is that blogging isn't about making money. It's about giving you a reason to go deeper into a hobby that already interests you. That's been the reward I've discovered over the past year, and I'd encourage anyone who's passionate about a hobby or an interest to start blogging. It has accelerated the rate at which I've tasted new wines, learned new things, and connected with people in the wine trade I would have never connected with. I've been amazed at the generosity and kindness of so many people I've come across online and in person of the past year. It's really given me a chance to do things I never would have otherwise done. There have been some amazing highlights (and lowlights) over the past year that I never wrote about. I got to meet with one of the most influential wine critics in the world in his tasting office. I was threatened with a lawsuit. I requested interviews that were granted and some that were ignored. I visited wine shops trying to convince store owners to work with me unsuccessfully, and wine businesses that I never heard of reached out to me. Wine businesses that are adverse to publicity still confuse me. In the coming year, I'd like to push in a number of directions I hope you'll find interesting. I'd eventually like to take on one or two more contributors to get the site to the point where it's publishing new content every weekday. I've got a couple of people in mind, but it's hard finding people with similar sensibilities and an interest in devoting time to wine writing. If you'd be interested in contributing to the site (even on a single-post basis) please drop me an E-mail. I'd love to chat with you. I'm looking forward to continued growth and continuing to provide useful information to people. It's in my blood- I want to provide people with helpful information. In closing, a sincere thank you to each of you who's visited the site, subscribed, linked to me on your site, re-tweeted something I've said, sent me a wine sample, advertised on the site, clicked on a link, bought a product through one of my links, made an introduction, invited me to an event, helped me write a piece, responded to an interview request, drank wine with me, participated in a product test, invited me to check out your wine shop, or otherwise made me feel part of the wine community. And especially to my wife and kids for giving me the time to devote to the site. I really appreciate your support and enthusiasm for what I'm doing.